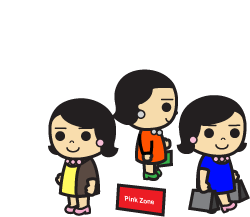 Pink Zones are a topic of debate and some Koreans are calling it reverse-discrimination. Several female-only areas (pink zones) have popped up across Korea as part of an effort to make women feel more comfortable and safe. These no-men zones include female-only library seating sections, lounges, smoking areas, buses, and parking. This entry was posted in Today's News and tagged female friendly, female-only zone, male-free by easykorean. Bookmark the permalink.